Additional Information: Yet another of the ubiquitous, often ugly 44-card box sets produced with impunity by Fleer throughout the middle of the decade. Fleer produced this set for the Revco Drug Store chain. Today is the second game of the Phillies’ two-game set with the Colorado Rockies, and it’s hard to believe (for me anyway) that the Colorado Rockies are now playing their 19th season as a MLB franchise — which is more seasons than the Toronto Blue Jays had completed when the Phillies faced them in the World Series back in 1993. Already the Rockies have plenty of names synonymous with the franchise: Todd Helton, Larry Walker, Andres Galarraga, and, more recently, Troy Tulowitzski & Ubaldo Jiménez. 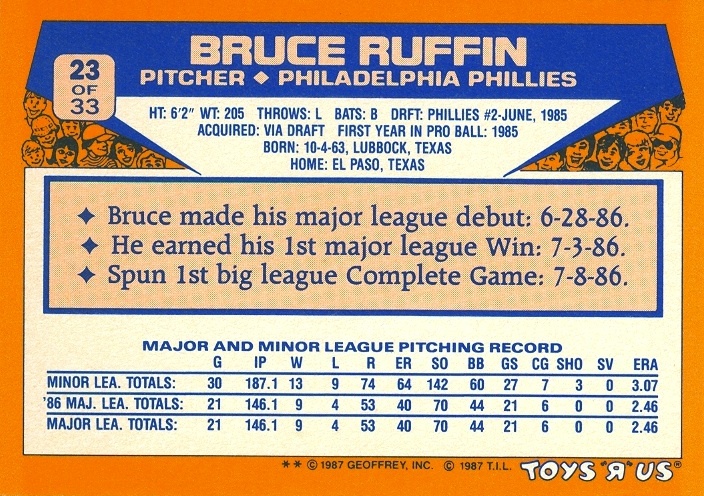 But there’s one name that I will always associate with the franchise even if no one else thinks of him when they think of the Colorado Rockies: Bruce Ruffin. 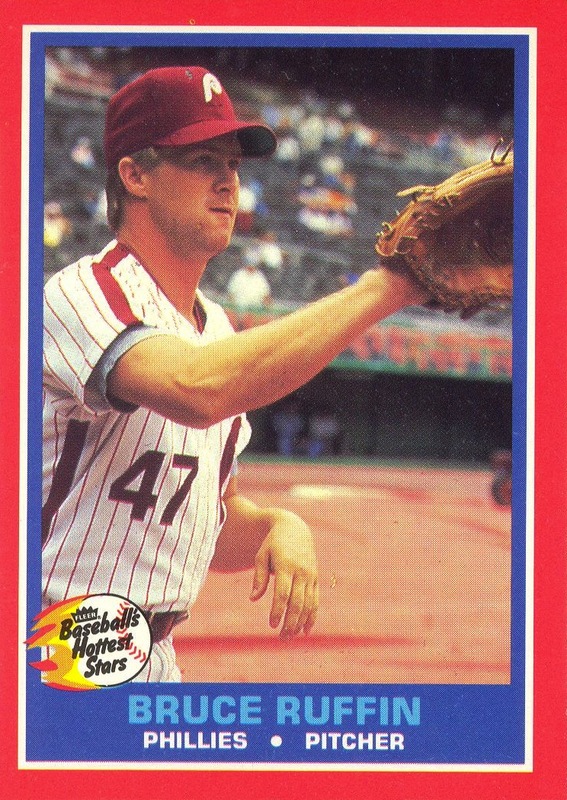 Bruce Ruffin had the dubious honor of being the player called up from AA when the Phillies decided to release Steve Carlton in the summer of 1986. At the age of 22, he surprised everyone by putting together an amazing rookie season in which he went 9-4 with a 2.46 ERA in 21 starts. Unfortunately, he didn’t get the attention he deserved during award season, and he finished 7th in the Rookie of the Year balloting even though based on WAR he was the second best rookie in the league, behind only Robbie Thompson — who didn’t win the award either. (Anyone care to guess who did win that year, without looking it up?) 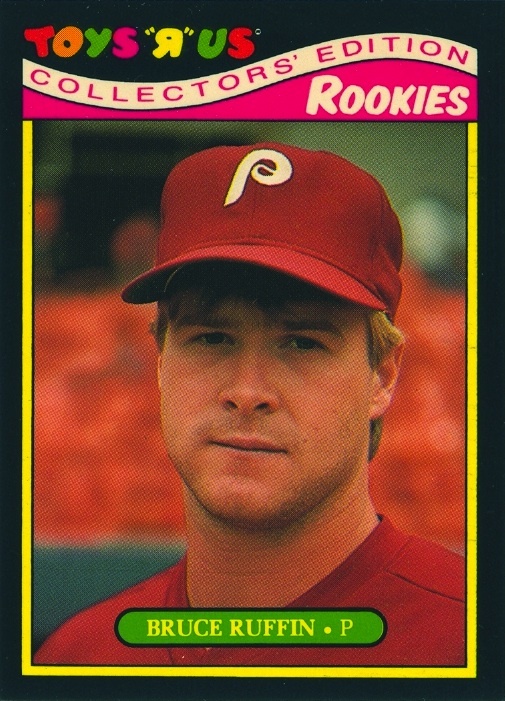 Everyone was excited about what the future might hold for Ruffin and there was reason to believe that he might help the Phillies better compete with the world champion Mets in the ’87 season. Alas, the ’86 season easily proved to be the best of Ruffin’s tenure with the Phillies. Over the next five seasons, Ruffin provided only two years of league average pitching performance against three woefully ineffective years. 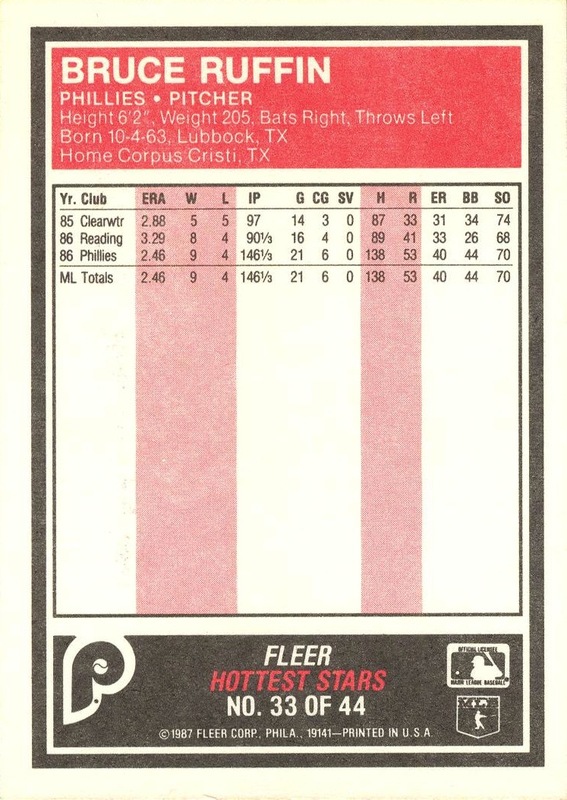 After spending all of ’87 as a starter, he spent the next four years bouncing back and forth between the bullpen, the starting rotation and AAA. Instead of becoming an ace, he ushered in era of Phillies prospects who dazzled us with amazing spring trainings or debuts, only to flame out and never be heard from again: Pat Combs, Jason Grimsley, Tyler Green, Rich Hunter, Brandon Duckworth. In fact, the Phillies weren’t able to produce a legitimate starting pitcher with any staying power in the majors until 1999 when Randy Wolf made his debut. After the ’91 season, the Phillies traded Ruffin to the Milwaukee Brewers for Dale Sveum. For a clue as to how far Ruffin’s stock had fallen, just check out Sveum’s stats prior to the trade. The trade ending up being a bust for both clubs, and both players were with new clubs by the start of the ’93 season. It was then that an amazing thing happened: in one of the worst pitching environments in baseball, Ruffin was reborn as a closer. It wasn’t an overnight transformation, but from the years 1993-1996 he was one of the best relievers in the league, and for three of those years, he was the Rockies closer. Even though he was no longer a Phillie, I was glad to see Ruffin finally carve a niche out for himself and finally emerge from the shadows of being Carlton’s replacement and not living up to the expectations brought by his rookie season. Until the Phillies faced the Rockies in the NLDS in 2007, whenever I thought of the Rockies, it was Bruce Ruffin who came to mind. Sadly, Ruffin’s career came to a shuttering halt in 1997. I have no recollections of how it ended for him, but when I did an internet search, I found in the Sports Illustrated archives that Ruffin was a victim of Steve Blass disease. It’s always sad to see a ballplayer develop it, but with Ruffin it was especially sad. According to the article, which SI published in its June 16 issue that year, much of Ruffin’s troubles during his time with the Phillies resulted from him struggling with his command. Having put together the four seasons that he had with the Rockies, it seemed that Ruffin had finally put it behind him. He would appear in only five more games after SI printed the article. So, in honor of tonight’s game, here’s Ruffin’s 1987 Toys ‘R’ Us Rookies, #23. His only baseball card in 1986 came courtesy of the end-of-year Sportflics Rookies set. Amazing, neither Topps, Donruss or Fleer felt the need to include him in their rookie/traded sets at the end of the season. In this day and age, it almost seems unfathomable that could have happened — in fact, if this had happened today, Ruffin would have had at least two Bowman cards before even appearing in his first Major League game. Unfortunately, Sportsflics cards are difficult to scan, hence the decision to go with the Toys ‘R’ Us card that commemorates his rookie campaign.